Although I missed the party Patch O'Black, local Jellicle cat threw in his Midnight Meadows, I can report on what happened in the Rose Garden. 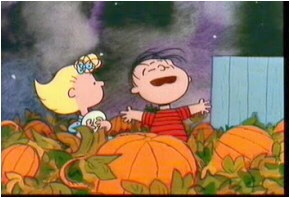 But for the night of October 31st, it had been made to look like the pumpkin patch in the cartoon, It's the Great Pumpkin, Charlie Brown. The sky had that watercolor purple and black wash look to it, and there were pumpkins and their vines everywhere! It was quite well done. Many SpinDizzy residents were in costume. Furpents became catapillars, civets were armored, centaurs were, well different centaurs, even the ballon folk got in the act by wearing one another. That was a sight to see! Some of the kits came dressed up and a few grown-up folk came as kits. They went around "trick or treating" the crowd who happily provided treats rather than get tricked. Because of other engagements, I missed the big bash at Patch's place, but if the fun had in the Rose Garden was transfered over there, it must have been a fun party. Hopefully there is a report on it elsewhere in this issue of @Action News! Q: What's the toughest airplane? A: A bad mother Fokker. Q: What do you call someone who really, really loves large blackbirds? Q: What kind of mustelids can fly? Q: What do planes do after a particularly bad flight? A: Apologize with much Boeing and scraping. Q: Who sets bird doctrine and elects their spiritual leader? A: The College of Cardinals (and Pyrrhuloxias). Q: Why was the aquatic bird addict arrested? A: The police caught him shooting up with pure heron. Q: Should you call it a walk? Q: Why did the ball player train a bunch of chiropterans to carry spheres for him? A: It was much easier to bat one out of the park that way. Q: What do you call an annoying bug in your soda? Q: Where does a 600 lb. gorilla sit? Q: Where does a 600 lb. gorilla sit at the airport? A: Right on your most fragile luggage, of course. Q: Why do only American fleas land on the Jetsons' dog? A: Because Russian fleas would be Cosmo-nauts, and Chinese fleas Taiko-nauts. Only American fleas are Astro-nauts. Q: Who wanders around the baseball stadium loudly selling falcons? Q: What do you call a fire lizard who can't quite get off the ground. Q: Why did the lightning bug turn in his light and clean out his desk? A: He became a fired fly. Q: Did you hear about the new and improved seagull? A: It gets your clothes whiter than before. Q: What do you call a flying centaur? Argon: "Seriously kid, those Internet spams are bogus. This is the real thing. Just one pill and you can add 3 - 5 inches.... to your tail!" Gilead: "Wow, that piece of spinach stuck in your molar looks exactly like Jesus." Suri: "The sinister Qoon ill advises the trusting Skwirl." Hi gang, here's the Spindizzy @Action News survey for this week...if you had your way, what snack (or snacks) would the Rose Garden oak carry? Angel_Bear says "I want Cracker Jack from the Oak Tree. Great-tasting stuff!" 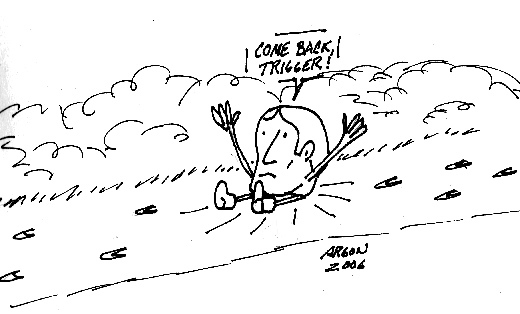 Argon says, "Most anything reasonable anyone cares to suggest." Niran says, "My answer to the @action news survey would be : Baklava!" Natasha says, "Insects? Oh, wait, it already has plenty of those." Andros says, "More Mexican and Italian foods."